Spring has sprung here in Northern California. Actually, it came weeks ago when the weather started getting warmer. I was watching my rhubarb plant daily but it remained the dark dead looking root that it has been all winter. I finally gave up checking on it, thinking it was a goner because of being trampled by kids and the dog last fall. Well, my wonderful hubby was out doing yard work last Friday when he came in and said my rhubarb had new leaves. Is it sad that I was excited?!?! Rhubarb is expensive so I love my little rhubarb plant. 🙂 Strawberry Rhubarb pie is also favorite around here. Anyway, I noticed the slugs or snails discovered the new leaves as well. We’ve had this problem before which sent me to Google for a more natural solution since we do have young children. The answer… egg shells. 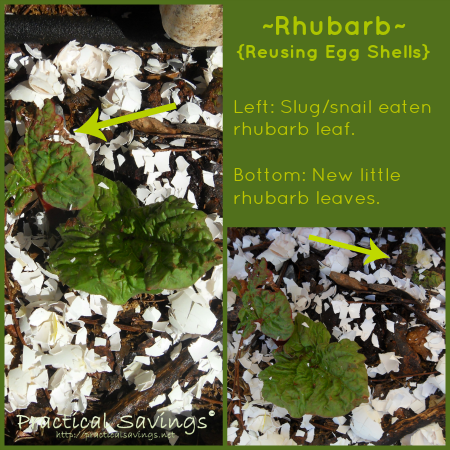 Egg shells have saved my rhubarb leaves so many times in the last couple years. Snails and slugs won’t cross the broken shells with their tender bodies. If they try, they will get cut up from the sharp edges. Using the egg shells has been such a simple solution. Granted, they won’t work for any flying insects, but those creepy crawly slugs and snails, yup, egg shells work wonders. So what about you? Are you reusing your egg shells this year? If you’re looking for more ways to use them, you can check out my ‘Reusing Egg Shells‘ post from the archives.